Full disclosure: I’m a longtime Apple fan. We got our first computer, a Mac 512K-E, in 1987 when I was seven years old. Since then I have gone through several Macs with my family, and since moving out when I was in college I have purchased a G3 iMac, G4 eMac, and Intel iMac. I use a PC at work, and while I am fully capable of transitioning between the two types of computers, I feel much more at home on a Mac. I thought this documentary, which claims to be “The documentary for the rest of us” (riffing on Apple’s “the computer for the rest of us” slogan from the early 1990’s), would be a nice exploration of the computer company of which I am rather fond, along with the creative minds behind their signature product. And it’s not that the documentary was bad, or even poorly made, it’s that I went away from it feeling as though there was so much untapped potential, so much brilliant source material, that was left entirely untouched by the filmmakers. The movie is mostly a series of interviews with people central to the culture of the Macintosh computer, along with a few individuals who helped bring the computer about in its early days and shepherd it along to the well-established niche market it enjoys today. These people range from software developers to design architects, columnists to analysts, and even the owner of the very first Apple retail outlet (which is two blocks from where my wife used to live near downtown Minneapolis). There’s even a trip to a Macintosh archive of sorts–several thousand square feet of storage owned by a very devoted Apple fan, who has multiple versions of nearly every computer Apple has ever produced. All this serves to shed some light on the eccentric culture of Mac-heads, and probably gives the uninitiated a bit of insight, if a little skewed at times, into the culture of Mac owners. Guy Kawasaki, the highlight interview of the movie. Certainly the meat of the documentary is the extensive interview footage with Guy Kawasaki, an early Apple employee who has spent the past few decades working closely with Apple as well as writing several books about the company and other computer subjects. His thoughts on Apple’s rise in the 1980s, fall from grace throughout the 1990s, and recent return to prominence, are funny, enlightening, heartwarming, and very down-to-earth. It’s clear that Kawasaki is not blindly waving the Apple banner, and he has several valid criticisms of the company and its leaders, but his place in Apple history affords him the luxury of being imminently qualified to offer his opinion in a way that few others can do. Careful readers of this review will note a particular absence of names, though: Jobs, Wozniak, Schiller, Ive, Scully, Amelio, even Gates…the people at the very heart of Apple, who have had immeasurable influence on the company since its founding over 30 years ago. While I applaud the filmmakers for cobbling together a decent chronicle of Apple, the fact that it is missing the most key players makes the entire project feel hollow. 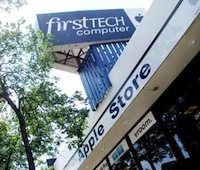 FirstTech, the original Apple Store, in Minneapolis. Along with the lack of key interview subjects, entire chunks of Apple’s history are either ignored or skimmed over so quickly that they might as well not even be included. In a stunning move, the entire period following the return of Steve Jobs to the helm of the company (arguably the most important chapter in the company’s history) is presented in a matter of minutes. iPods, iMacs, iPhones, and other such monumental achievements flash by as a series of images and are subsequently all but ignored. 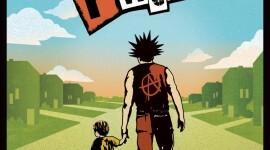 Rather than spending several minutes discussing product serial numbers with retail store owners, or digging through a collection of Apple ][ machines in a storage shed, or interviewing a bitter ex-Apple employee who still can’t let bygones be bygones, it would have been good to see a documentary that really is for the rest of us.